Other titles: Moore’s Almanac/Vox Stellarum, A Loyal Almanack, etc. London, England. Publisher: W. Foulsham & Co. Editor: Francis Moore, Tycho Wing, Henry Andrews, et al. 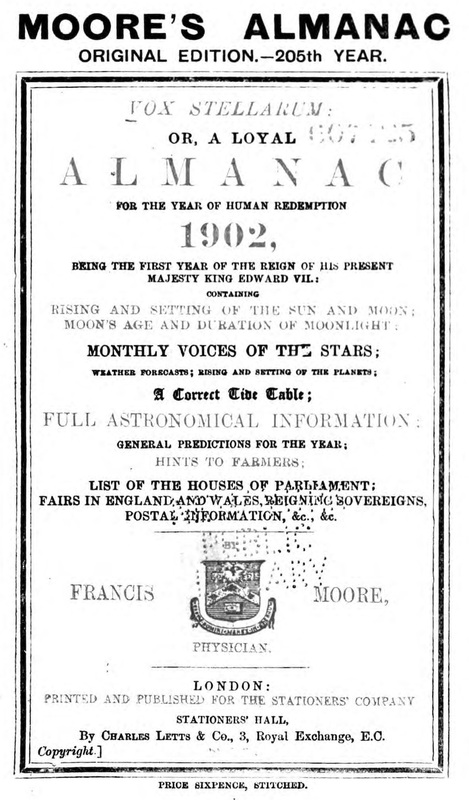 This began in 1697 as a weather prognostication almanac for farmers put out by Francis Moore. In 1700 for the year 1701, Moore shifted the emphasis to astrology under the titles Vox Stellarum: A Loyal Almanack, Old Moore: An Almanack, and Old Moore: An Ancient Almanac, Offering Astrological Forces and Determinants. Various name changes over the years but the journal was always popularly referred to by some variant of Old Moore’s. A monthly companion, Old Moore’s Monthly Messenger, was started in 1907.